Mobile devices have become an important part of our everyday life, harvesting more and more confidential user information. Their portable nature and the great exposure to security attacks, however, call out for stronger authentication mechanisms than simple password-based identification. Biometric authentication techniques have shown potential in this context. Unfortunately, prior approaches are either excessively prone to forgery or have too low accuracy to foster widespread adoption. In this paper, we propose sensor-enhanced keystroke dynamics, a new biometric mechanism to authenticate users typing on mobile devices. The key idea is to characterize the typing behavior of the user via unique sensor features and rely on standard machine learning techniques to perform user authentication. To demonstrate the effectiveness of our approach, we implemented an Android prototype system termed Unagi. Our implementation supports several feature extraction and detection algorithms for evaluation and comparison purposes. 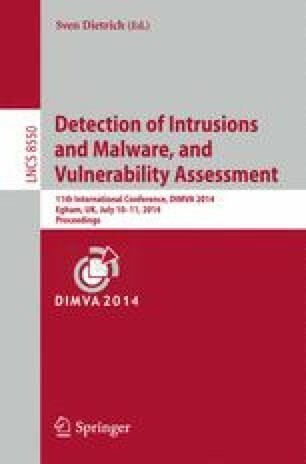 Experimental results demonstrate that sensor-enhanced keystroke dynamics can improve the accuracy of recent gestured-based authentication mechanisms (i.e., EER>0.5%) by one order of magnitude, and the accuracy of traditional keystroke dynamics (i.e., EER>7%) by two orders of magnitude.